Margarita Robledo Guedes is the Outcome Broker for GHHI Rhode Island. In this role, she is responsible for coordinating multiple federal, state and philanthropic resources and working with state and local municipalities and nonprofits to develop programming that provides low-income Rhode Island residents with integrated energy efficiency, health and safety housing program services. Ms. Robledo began her social health advocacy work in 1995. She served as the Education Coordinator and lobbyist for The Childhood Lead Action Project coordinating the development of legislation and community outreach to protect families from lead poisoning. Her untiring advocacy resulted in policy and legislative changes in Rhode Island laws. 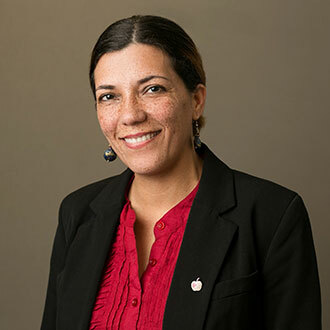 As the Director of Community Education at Bristol Community College, Ms. Robledo concentrated her efforts on the development of workforce training programing in the areas of healthcare and green energy. Her programs also entailed managing and developing courses for community residents as well as business and industry professionals alike. Ms. Robledo is currently pursuing a master’s degree in higher education from Eastern Nazarene College with an emphasis on adult learning and the social pedagogy of cross-cultural and bilingual academic participation and inclusion.